Battleborn’s massive winter update drops today, bringing massive changes to Gearbox’s game, including full access to the game’s 25 launch characters, new training modes, and enhanced UI and 4K support for PS4 Pro. All that, plus the game’s third story DLC and fifth free character. 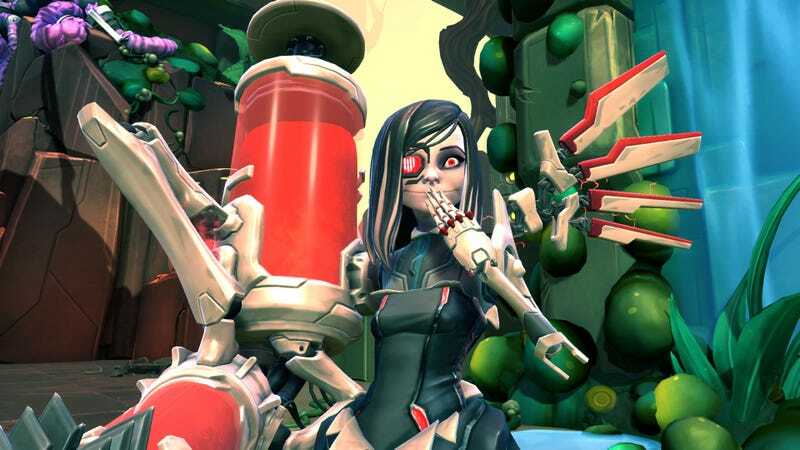 Before we get to the big changes, let’s meet Beatrix, the fifth and final free DLC character for Battleborn. She’s the one in the picture at the top of the article. She’s a medical professional. Isn’t she sweet? No. No she is not. Beatrix will be available for unlock today for season pass holders, with non-holders able to pick her up via hero key or in-game currency next week. Also dropping today, free for season pass holders, is the third of five promised premium story DLC missions, Oscar Mike Versus The Battle School. It looks lovely. But the big news today is the rest of the Winter Update, which changes the way various aspects of Battleborn work. For expample, once the update is released later today, players will no longer have to work their way through unlocking all 25 of the game’s launch characters. If you’ve not unlocked them all, now you have. If you’re new to the game, you’ll have them all available from the get go. Completing the character challenges that once unlocked characters now rewards players with special skins for each hero. Characters that were unlocked with keys will have those keys returned to the player. Players will finally be able to test out characters in a training-friendly environment in the Dojo, battling waves of minions while learning the ropes. A new Incursion tutorial will prepare players for PVP with a single-player battle followed by a repeatable mission for groups of up to three. PVP players can now exercise their power with the game’s Draft Mode, allowing for picking and banning characters in private and public matches. The user interface gets a much-needed overhaul, making it cleaner and easier to follow. Main quests and daily quests give players new reasons to hop on and play. Command and Character rank caps have been upped to 150 and 20 respectively. Players will accrue in-game credits faster. On top of all of that, the winter update adds a 4K, 30 frames per second option for the PlayStation 4 Pro, with 1080p, 60 frames per second available on Xbox One, Xbox One S and PlayStations 4. You can read more about the Battleborn winter update over at the game’s official website. The update will be going live at 5PM Eastern time. Expect a tiny flood of new and returning players to arrive soon after.